AnyMP4 DVD Creator, the newly released and professional Video to DVD Burner, will bring users a lot of surprises of burning DVD with various popular videos like 3GP, AVI, MP4, TS, FLV, MKV videos, and it can also create DVD folder and ISO file at your fingertips. The created DVD disc would get the perfect effect when playing on most portable and home DVD players. 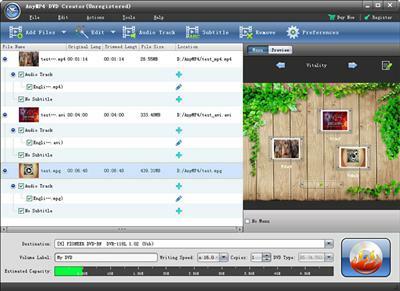 Besides, AnyMP4 DVD Creator enables you to edit video source file like adjusting effect, trimming, cropping, and adding watermark. What's more, this DVD maker can help you freely add/edit the audio track and subtitle, and provide multiple menu templates, frames and button styles to choose; even the background music, picture, and opening film can be selected according to your preferences. With the intuitive interface, you can finish the whole process of burning DVD just in a few clicks. You can add several video files to this DVD Maker and create the DVD folder and ISO file. The created DVD disc can be played well on most portable and home DVD players. AnyMP4 DVD Creator can help you adjust the video effects, trim video for the needed length, crop video frame to get rid of unwanted video black edges, join multiple video clips into one file, and add text/image watermark to the video, etc.